Need to give a discount to a particular customer or a list of clients? 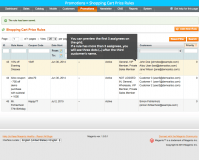 Use Individual Promotions for Magento. The extension allows you to create discount rules that apply to a hand-picked group of assignees. 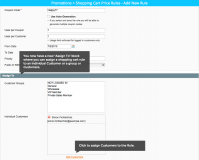 By default, you cannot create a coupon or a shopping cart rule that applies to an individual customer in Magento. With Individual Promotions extension for Magento, you can go real granular defining discount conditions. There is no need to hide a wide-spectrum coupon from everyone but for that one user anymore! The Individual Promotions extension is easy to use: it creates an additional “Individual Customers” field in the “Assign to” section of standard Magento Shopping Cart Rules. Note: if you wish to assign the rule to specific customers, you don’t need to select any Customer Groups, or else the rule will become valid for everyone in that group. Easily give one-off discounts to selected customers. Be flexible when creating personalized discounts. Make the same discount apply to a large group and to a hand-picked list simultaneously. Promotional marketing provides a great way for increasing customer awareness of a brand. Coupled with a personalized approach, this tactic has the power to skyrocket your sales. Use the extension to provide buyers with individual discounts and the results will not take long to come. A well-thought-out promo-campaign warms up buyers’ interest in your products. By offering targeted coupons to selected customers, you encourage them to check out your store once again. Not only it increases the website traffic, but also has a positive impact on your conversion rates. Limited-time deals foster quick decision-making as they instantly create a sense of urgency in the customer’s mind. Set up personalized promotions and specify their duration – this will become a compelling reason for your customers to make a purchase on the spot. . 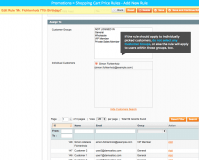 Assign coupons to individual registered customers in Magento. Associate a shopping cart price rule with several customers. Create shopping rules that apply to a hand-picked list of clients. Combine group and individual coupons/shopping cart rules. Edit your list of assignees at any time. 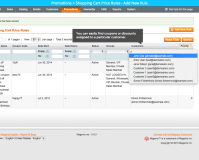 Assign a coupon/shopping cart rule to an unlimited number of customers. The extension functionality code is 100% Open Source. Compatible with Loyalty Program, a Magento extension that allows you to reward regular buyers and lavish spenders of your store. Magento Gift Wrap extension - Set up an optional service, such as gift wrap, rush order, and charge extra for it! Magento Frequently Bought Together plugin - Take advantage of upselling and cross-selling at your store. Showcase similar and alternative products as well as best sellers as visitors browse your product pages to increase the chances of a purchase. Magento Birthday Gift Registry extension - Allow customers to create wish-lists for any occasion, set priorities for items in the list and share them with friends. Buyers can protect registries with a password and track the purchases made. See all Marketing and Promotion plugins for Magento. 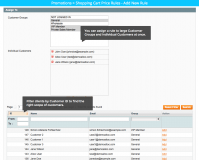 * Fixed SQL error when applying filters to Customer Group in Shopping Cart Price Rule. This extension was the icing on the cake for our Loyalty Program extension. The goal was to let the sales guys make individual promises to customers and when they logged into our site, they were there and automatically applied to their transaction. This really enhances the customer interaction level through the site too. In the past people would prefer not to use the site for transactions because they knew they would get a better deal in person. This has changed and for that, we thank you! The extension did exactly what it was supposed to an the release notes were well documented. Sell more by showing clients related products according to a smart logic in Magento.